For violinists, violists and cellists aged 6 - 9. One- or two-week program, non-audition based. Click here for more information. Junior string classes take place weekdays from 9:00 - 5:00. In addition to daily chamber music coachings and electives, ECCF Junior Students participate in weekly chamber music performances, daily coachings, weekly private lessons, guest artist and faculty master classes, string orchestra and a variety of electives and workshops, as well as recreational activites. ECCF Day Students are also encouraged to attend the Faculty and Guest Artist concerts on Wednesday evening of each week. Please note: Morning classes Thursday, July 3. Final concert is Saturday, July 13. Junior string classes take place weekdays from 9:00 - 5:00. In addition to daily chamber music coachings and electives, ECCF Junior Students participate in weekly chamber music performances, daily coachings, weekly private lessons, guest artist and faculty master classes, string orchestra and a variety of electives and workshops, as well as recreational activites. Meals and staff-supervised dormitory housing are provided on the Yale University campus for the two weeks for students that have completed 6th grade at the start of ECCF 2019. Extracurricular dormitory life includes evening practice time, concerts, master classes, movie and game nights, campus cook-outs and pizza parties. Weekends include planned group activities and a night of sampling some famous New Haven pizza. Over the two weeks, students will also have the opportunity to take advantage of the benefits of the Yale campus, such as visits to the Yale Art Gallery, Rare Instrument Collection, or Beineke Library. For students that have not yet completed 6th grade at the start of ECCF 2019, meals and shared dormitory housing are available for students aged 8 – 11 along with their parents on the campus of Yale University for the two weeks. Junior string classes take place weekdays from 9:00 - 5:00. After class hours, students and their parents can participate in evening movie and game nights, swimming in the campus pool, tennis, campus cook-outs and pizza parties. Weekends include planned group activities and a night of sampling some famous New Haven pizza. Over the two weeks, students will also have the opportunity to take advantage of the benefits of the Yale campus, such as visits to the Yale Art Gallery, Rare Instrument Collection, or Beineke Library. 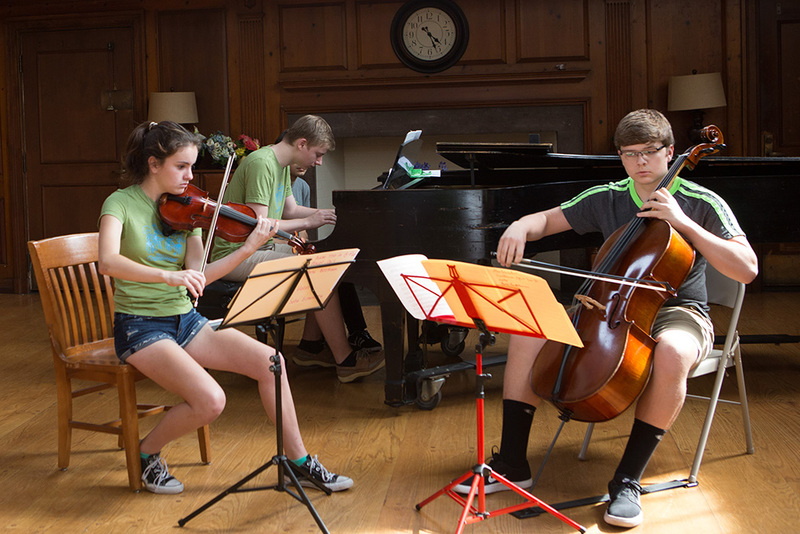 Students participate in weekly chamber music performances, daily coachings, weekly private lessons, guest artist and faculty master classes, string orchestra or piano seminar and a variety of electives and workshops. Dormitory housing is provided on the campus of Yale University. Evening activities include rehearsals, practice time, concerts and recreational time. Evening master classes, rehearsals and concerts take place daily until 8:30 or 9:00pm. 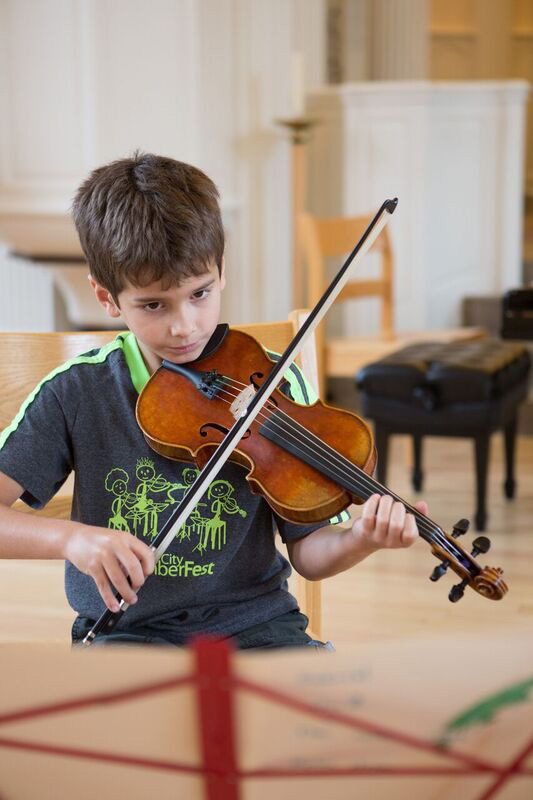 In addition to daily coachings and string orchestra, students have weekly private lessons and participate in guest artist and faculty master classes. 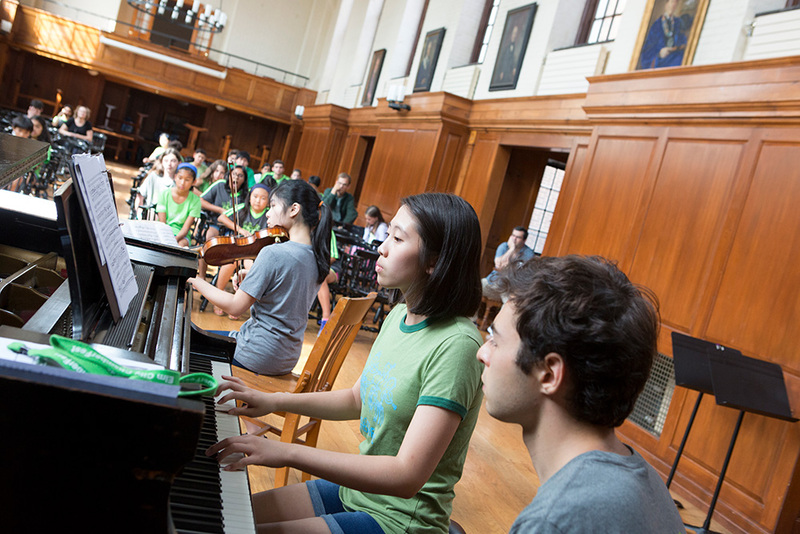 To gain different perspectives, students can choose from a variety of electives and workshops including conducting, Jazz, Klezmer, theater improvisation, recording, music theory, Yoga and Alexander Technique. The primary focus during lessons is on ensemble playing and repertoire; however, there are opportunities to perform solo repertoire for guest artist master classes. 3:00 – 4:30 Master classes, workshops, group rehearsals or individual free time. 6:30 Evening rehearsals, master classes, workshops or recreational activities. Faculty and Guest Artist concerts are on Wednesday, July 3 and Wednesday, July 10. These evening concerts are optional for commuting students, but are extremely inspiring and highly encouraged! Student concerts are at the end of each week. Audition Requirements: Live auditions are strongly encouraged, however, should you be unable to attend a live audition, please submit a recording via our online dropbox. Senior strings live audition requirements: One solo work representative of your level of playing, and one major AND one minor 3-octave scale plus the corresponding arpeggio of your choice. You will be asked to do some sight-reading. Senior strings recorded audition requirements: Two contrasting solo works representative of your level of playing and one major AND one minor 3-octave scale plus the corresponding arpeggios of your choice. ECCF’s Advanced Piano Institute is a small and select program, where pianists work closely with faculty and guest artists on refining solo repertoire as well as their chamber music assignments. In addition to a daily chamber music coaching, pianists’ schedules include practice time, solo repertoire and technique classes, twice-weekly private lessons as well as student’s choice of electives. Pianists collaborate in chamber music with the string players from the ECCF Senior program. Electives like Alexander Technique, yoga, music theory, jazz theater, improvisation and more allow students to broaden their perspectives, while masterclasses with guest artists like Joan Panetti, Wei-Yi Yang and Blair McMillan provide inspiration and insights. 3:00 – 4:30 Master classes or workshops, group rehearsals or individual free time. Faculty and Guest Artist concerts are on Wednesday, July 3 and Wednesday, July 10. These evening concerts are optional for students, but are extremely inspiring and highly encouraged! Student concerts are at the end of each week. Two scales and arpeggios of your choice, 2 contrasting pieces (for example: a movement of Bach and Chopin) and you will be given a sight-reading excerpt. Live auditions are strongly encouraged, however, should you be unable to attend a live audition, please submit a recording via our online dropbox no later than March 31. Recorded auditions should include 2 major and 2 minor scales, plus arpeggios in addition to your contrasting pieces.